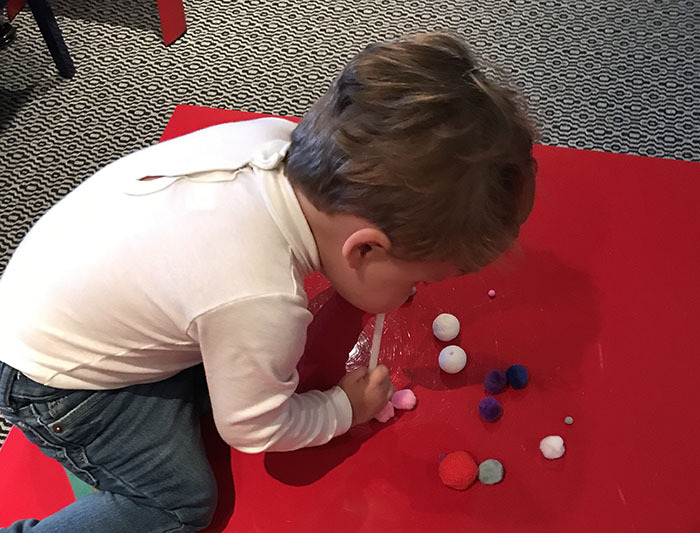 This pom pom blowing activity for toddlers is a fun little game to play with them when you have 5 minutes to spare. Not only is it a fun, but it also has benefits in developing oral motor skills. Make sure you follow my toddler board on Pinterest for more ideas. Don’t forget to save the pin for later. 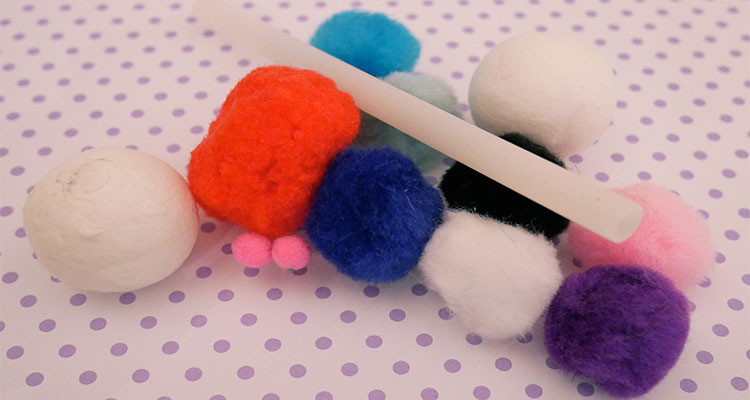 Simply put some pom poms, or cotton balls, in a line on a table. Then get your little one to blow them across the table using a straw. With BB I simply let him just blow them where he liked, but if you have a slightly older child you could also add some tape and get them to blow the pom pom along that. I turn my back for 5 seconds and he is up on the table. 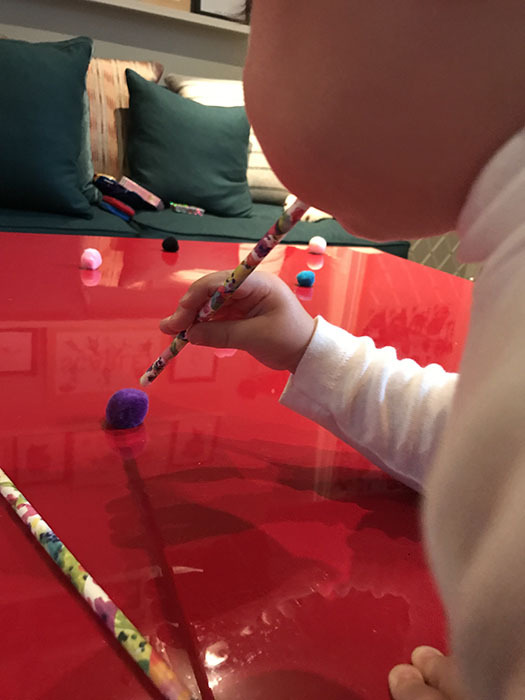 BB had a wonderful time trying to blow his pom poms off the table. I used a variety of sizes for him. He could get the small ones to travel quite far, but it took a lot more breath control to move the bigger ones. To start with I gave him a paper straw, but that didn’t last very long. It got very wet, and he bit down on them. Next I tried a reusable silicone one from one of his cups, which worked much better. I have actually just left the pom poms and the straw on the table so he can go back to it as many times as he likes. Obviously I wash the straw once he has finished. First I will say I am absolutely no expert when it comes to speech development. If you have any concerns about your little ones please speak to a professional. However, over my many years of working with children and doing my own research, I have learnt that straws are beneficial to improving oral motor skills. It helps develop lip seal, tongue retraction, cheek and tongue strength, and an appropriate resting position of the tongue. Blowing through a straw can also help with breath control and with producing certain vowel sounds like “ooh”. 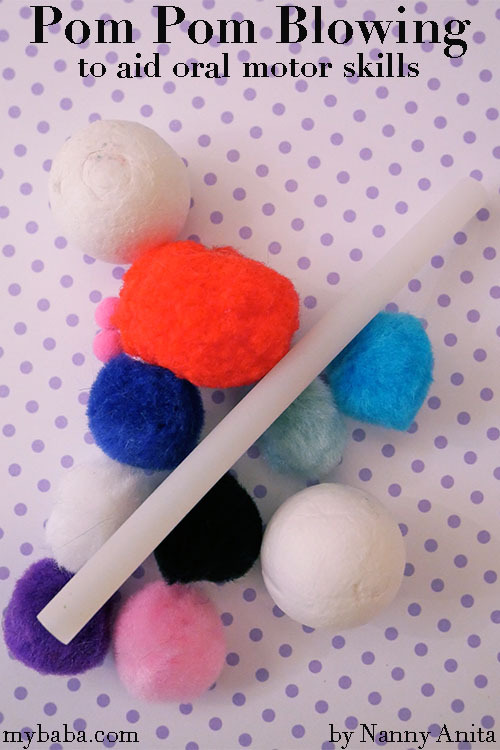 If you enjoyed this pom pom blowing activity be sure to check out my ABC flash cards.